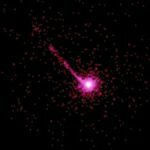 The Guide to the Universe Blog is my "update noticeboard" for this website. It lets you know whenever any new Web pages, or additions to existing ones appear on the Guide to the Universe and, I can assure you, things are happening all the time! Don't worry - it's easy! And, if you later decide you don't want it, you can delete the feed. Alternatively, if you already keep a personalised home page on "Google", "My Yahoo! ", "My MSN", "Newsgator", or "Bloglines", just click on the appropriate button. If you want a more detailed explanation of what an RSS feed is, click on the question mark above the orange button. I think you'll find the potential of the RSS feed surprising - and enjoyable! The Guide to the Universe is now a fully secure site. Any page you visit will display a padlock in the search bar, followed by a URL beginning with https. This confirms the security of the page. Also, in the light of the General Data Protection Regulation (GDPR) coming into force on May 25, 2018, I can assure my site's visitors that Guide to the Universe is now fully compliant with this regulation. Continue reading "GDPR and Site Security"
Continue reading "Ring Galaxies - some of the stranger sights in the Universe"
Continue reading "Starburst Galaxies - areas of intense star formation"
New amazing close-ups of the dwarf planet, Pluto and its largest moon, Charon, courtesy of NASA's "New Horizons" space probe. 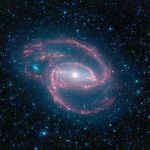 Continue reading "Spiral Galaxies - the most common in the Universe"
A new study throws more light on what dark matter actually might be. 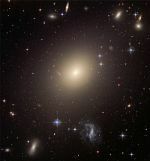 Continue reading "New Findings Regarding Dark Matter"
Continue reading "Elliptical Galaxies - how they form is still a mystery"
If you're lucky enough to live in the UK, don't forget that you'll be able to witness that rare event, a solar eclipse tomorrow. From the UK, it won't be total, but over 90% of the Sun will be obscured. The further north you are, the better. As regards a time, in London for example, it'll begin at around 8:25am GMT and last for 2 hours 16 minutes. The weather forecast isn't very promising, unfortunately, but it's likely to get quite dark. 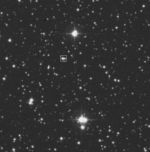 Continue reading "Variable Stars - regularly fluctuating in brightness"
Continue reading "Multiple Star Systems - the rule rather than the exception"
Hi everyone. Just in case anyone's wondering why there's not really been anything happening on the site since well before Christmas, perhaps I'd better explain. I've developed a cataract in my right eye that eventually became so bad it made reading a computer screen well nigh impossibe, because of the glare. I hope to have cataract surgery within the next few weeks, after which, hopefully, normal service will be resumed. I hope you all understand and will bear with me. 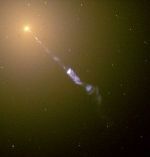 Continue reading "Quasars - the most famous type of active galactic nucleus"
Continue reading "Seyfert Galaxies - one type of active galaxy "
Continue reading "Active Galactic Nuclei - high electromagnetic emissions from galactic centres"
Continue reading "Weird Star Theories - physicists' wildest imagination at work"